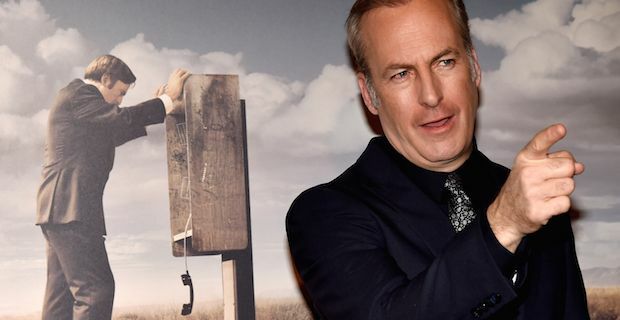 TV fans were this week treated to the first episode of Breaking Bad spin-off Better Call Saul and the general consensus is that AMC are onto another winner. The series is once again penned by the genius that is Vince Gilligan and so is steered by someone who is intimately positioned to develop Saul's character from scratch. Set in a time which is approximately 6 years before Walter White is given his ill-fated cancer diagnosis on Breaking Bad, we are introduced to Saul living his post Walter White life. He is wearing a crappy disguise and is now working as a baker while reliving his glory days as Albuquerque's premier crooked lawyer on old video tapes when he gets home from work. Snap back to the show's present and we are introduced to Saul before he became Saul, otherwise known as Jimmy McGill. Jimmy is starting out in his legal career and struggling to make his mark on the legal world as he works form the bottom rung as a legal defender. He is seen giving himself a pep talk before he walks into the courtroom to defend 3 young offenders who engaged in a little necrophilia. Understandably, things don't go great for him once the judge sees some of the evidence against his clients. Afterwards, he makes a great speech about money being the point of it all, easily noticeable when we knew him in BB, when he picks up his cheque for $700 which is not to his liking one bit. Another stellar moment was when he answered his phone pretending to be his own assistant, female may we add! The point of the episode was to show us all a man who is clearly disillusioned with his lack of finances and standing and he is prepared to beg, steal and borrow his way to get to the top, whatever the stakes. There was even a nice little appearance by Mike Ehrmantraut who charges Saul $3 as part of his duties as a parking lot attendant at the court room hinting that we may get to see exactly how that partnership blossomed from the very outset. All in all, a solid start to the new series of Better Call Saul and hopefully the standard can remain high throughout just like the show whose boots it is trying to fill.